These are some of the 71 dogs beagles from a home by the Lehigh County Humane Society. The organization is asking for donations of wet dog food, money, leashes, and/or towels and sheets to help care for the dogs. The Lehigh County Humane Society rescued dozens of dogs being kept in unlivable conditions at a house in Upper Saucon Township on Saturday night. Humane Society staff went to the house after receiving a noise complaint call. Based on the call, they expected to find about 25 dogs, WFMZ reported. 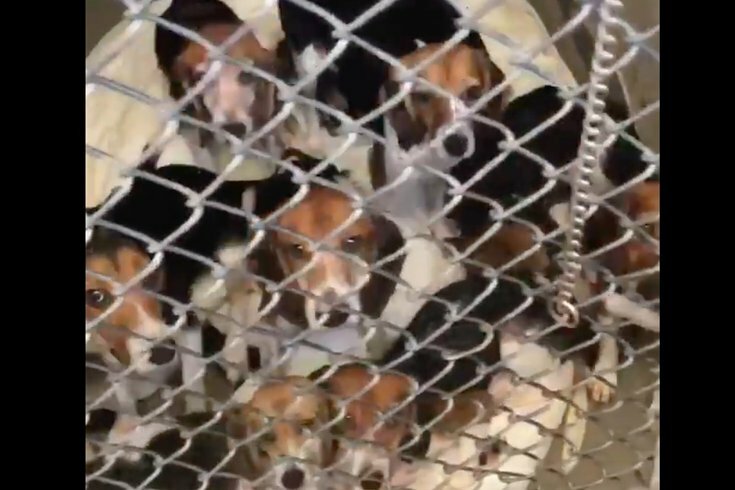 Instead, they found 71 dogs, all beagles, crammed wall-to-wall in a small space. On Sunday, Lehigh County Humane Society Officer Barbara Morgan received formal consent in writing by the dogs' former owner for the Humane Society to take over ownership of the dogs. The dogs reportedly had been inherited after their original owner had died. Now the Lehigh shelter is faced with a sudden influx of dozens of dogs that need care to recover from the poor conditions of their captivity. The shelter shared footage of the dogs on Facebook Sunday. The shelter asking for donations of wet dog food, money, leashes, and/or towels and sheets to help support the Humane Society's efforts to care for the beagles. See the full donation requests here. Officials are further investigating the situation and could possibly charge the dogs' former owners with animal cruelty.